“Ministry Essentials: Introduction to Catholic Teachings”, taught by Dennis Mahaney, will be offered in room 115 on Mondays, 6:30-8:30 p.m., for 12 weeks beginning September 11. 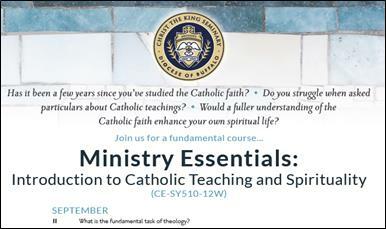 The course is part of the Christ the King Seminary’s Continuing Education Program and is open to anyone. This introductory course will explore essential Catholic themes, history, and vocabulary for ministry and teaching the faith. Topics will include: theology; Jesus the Christ; understanding the scriptures; sacraments; the role of grace and redemption in the life of disciples; origin and mission of the Church; morality; forming a Christian conscience; prayer and spirituality; developments in Catholic thought since Vatican II; and social justice. Each evening will cover one specific topic and will start with a brief introductory activity, video or reading distributed prior to the session. Registration is $35. To register visit cks.edu for the Continuing Education registration materials or contact Julie Galey (jgaley@cks.edu or (716) 655-7081).